Show the children the tealight candle and remind them that their pot must be large enough for the candle to fit inside. Flatten out the bottom of the ball to make a nice flat surface for the Diya (so it will sit sturdily on a table without risk of it falling). Let air dry or bake dry depending on the type of clay you are using. Make a flat "pancake" of clay that's larger in diameter than the tealight candle. This will be the bottom of your diya. 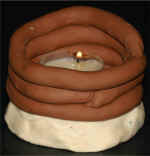 Roll remaining clay into long snakes. Coil the snakes around the pancake of clay, building up the pot as you go. You'll need to squeeze the snakes onto the pancake and onto each other a bit so they stay together when the project dries.